With almost every premium car manufacturer offering an SUV, is it any wonder that brands such as Jaguar are cashing in? 2016 saw the launch of the F-Pace & in late 2017 the electric I-Pace arrived. Sandwiched between the two & most recently delivered to Company Car Towers, is the E Pace. We liked the F-Pace as does the UK car buying public, with it being the fastest selling Jaguar of all time. How then would it’s more compact sibling perform & is the E-Pace a case of one SUV too many ? In the flesh, the E -Pace is actually more attractive than the F-Pace & to my mind, is one of the best looking mid-range SUV’s on the market. It’s based on the same chassis as the Range Rover Evoque, but the E-Pace manages to look more masculine than the Evoque. 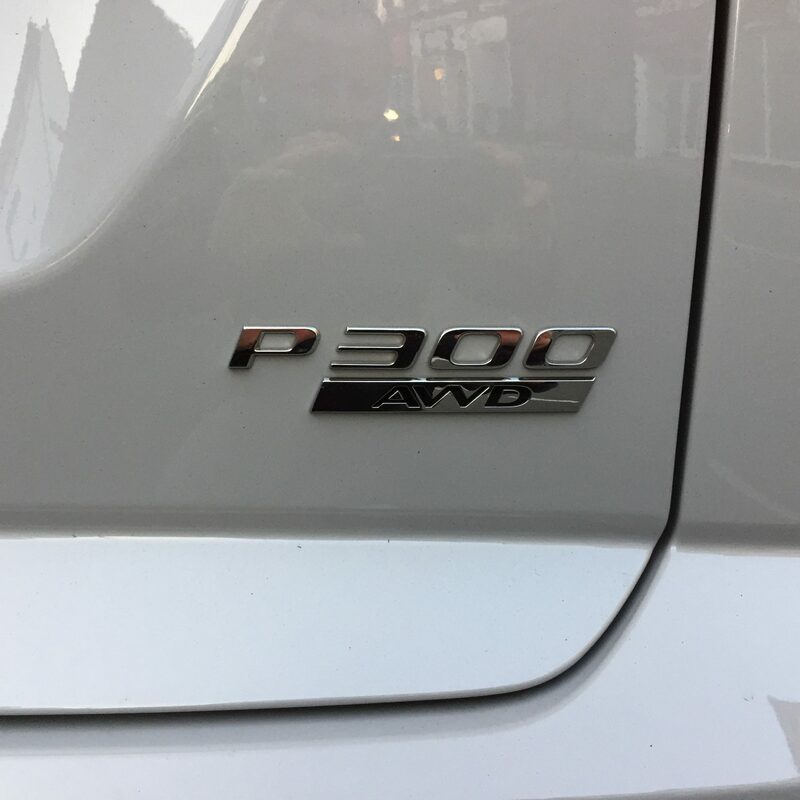 Customers can have there E-Pace with two petrol engines; a 247bhp unit or a 296bhp ‘P300’ model, which we were driving & available only with 4WD & JLR’s nine-speed automatic transmission. Or select from three diesels. An entry level 148bhp (D150) unit with front-wheel-drive & six-speed-manual gearbox. It’s all on offer with 4WD in manual or auto. The mid-range 178bhp (D180) in 4WD manual or auto, plus the most powerful diesel, the 237bhp (D240) twin turbo which comes in 4WD & automatic format only. For business users, the most efficient choice would be the front-wheel-drive, manual diesel D150, which offers emissions of 124g/km. Whilst the E-Pace looks great from the outside, what’s it like on the inside ? Our test model was the HSE R-Dynamic, so unsurprisingly, the interior was incredibly well finished. Standard spec included Mars Red Windsor leather sport seats with red stitch & an ebony/mars red interior, plus ebony suede cloth headline, which costs an additional £820. The overall ambience is lovely, but the small cabin in this combination of colours feels dark. There was a fixed panoramic roof fitted to our test car, which does brighten that cabin, but this will add an additional £970 to the cost. Better I feel, to have chose a lighter coloured headline to brighten things up. The steering wheel contains the usual suspects, i.e buttons to control the infotainment system, cruise control, hands free telephone & vehicle information. Jaguar have sensibly kept the heating controls separate from the 10” touchscreen & these sit below the infotainment screen. The automatic gear lever is underneath these, with the driving options toggle switch alongside. This allows you to select from Dynamic, Comfort, Eco & Rain-Ice-Snow settings. We tried out al of the, settling for Comfort which we felt offered the most satisfying combination of fun & economy. Connectivity is paramount nowadays. As standard, you get a pair of USB sockets and four 12-volt sockets fitted, but you can sacrifice one of the 12V inputs as an option, to gain three more USB ports for rear occupants. Despite being smaller than the F-Pace, the E-Pace is actually surprisingly spacious. There’s plenty of head & leg room in the front & in the rear & four adults will sit comfortably on a longer journey. Internal storage is really very good too. All four door pockets are actually big & useful, there are two cup/bottle holders behind the gear lever, a decent sized glove box & a deep 8 litre central ‘bin’ between the front seats, which is enormous. Even better news is that the Jaguar’s boot offers 577 litres, a massive 150 litres up on the Audi Q3. The entry to it though is narrow.With the rear seats lowered though the E-Pace provides 1,234 litres compared with 1,325 litres in the Q3, a disappointment for which I’m still scratching my ahead about. Jaguar spoiled us, by loaning us the top-ofg-the-range R-Dynamic with HSE specced model, which features pretty much everything you’d want in your car. Keyless entry, LED headlights with signature DRL, Auto High Beam Assist (AHBA), Connect Pro Pack consisting of Pro Services with Wi-Fi Hotspot, Smartphone Pack consisting of InControl Apps, a Meridian™ Sound System – 380W, Park Pack consisting of 360° Parking Aid, Rear Traffic Monitor and Park Assist & a Drive Pack consisting of Adaptive Cruise Control with Queue Assist, High-speed Emergency Braking & Blind Spot Assist. Safety is definitely taken care of. Jaguars should be fun to drive & I’m pleased to say that the E-Pace is. It’s not necessarily the best in class for driver engagement or agility, but when pushed either on winding B roads or if required, to overtake slow moving traffic, it’s nothing other than composed, with the 20” wheels eating up the tarmac in front of you. In Dynamic mode, the drive gets tighter & the suspension & ride firmer. Eco mode is a sensible choice on the motorway whilst we felt that Comfort mode was best in town. We drove the E-Pace for 7 days on all types of roads, in mainly warm & dry conditions & averaged 25.9 mpg, some way shy of the official combined figure of 35.3mpg. The most powerful engine in the E-Pace range emits 181g/km of CO2, so for those of you reading this who want to save on your fuel bill, take a look at one of the three diesel options all of which will offer you better than this. So, the E-Pace, especially in top-of-the- range spec HSE, is a lovely place to be & is both fun to drive & usefully spacious. If have a criticism it’s minor & it revolves around the infotainment system. Yes it looks good & it’s fairly simple to work, but the InControl system that Jaguar runs, lags behind other systems, such as BMW’s iDrive. It’s too slow to respond to inputs & the fact that smartphone integration is via JLR’s own software, is disappointing. Android Auto or Apple CarPlay are not an option, because neither of these services is offered. On a premium SUV you should expect this to be standard. For example, even the latest MG SUV the ZS, comes with Apple CarPlay. This niggle aside, I have to say that the E-Pace surprised me & in a good way. I thought it would be tight in the cabin & it’s not. I thought it would be a poor relation to the F-Pace & it’s not. I thought it would be a compromise on many levels, but it’s not. 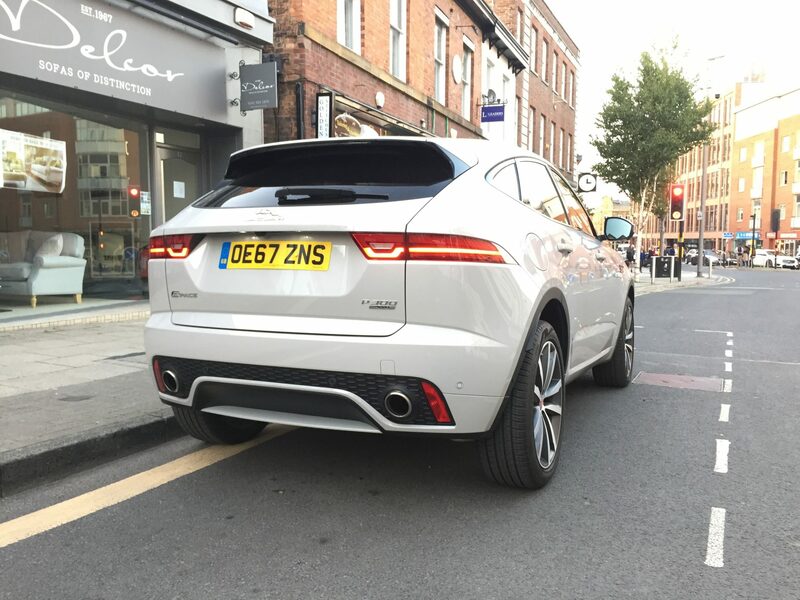 Given the choice of an Evoque, X1 or Q3, I would unhesitatingly choose the Jaguar. Perhaps from a fiscal perspective, a diesel in lower spec would make more sense, but none the less, this is a compromise I’d be prepared to take, just to spend more time in this lovely Jaguar. Definitely not an SUV too far 4.25/5.